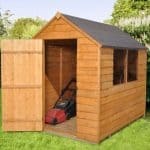 The Waltons Groundsman Tongue and Groove Apex Garden Shed is just the thing you need to keep your tools in a tidy and clutter free manner, with a more spacious interior than your ordinary garden shed. With space a plenty, you no longer need to litter the backyard with all your gardening tools and equipments. This garden shed can also be used as a den or a play shed for children, a quiet little place to spend some time on your own. 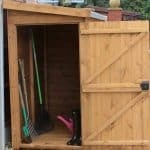 There are numerous possibilities of utilising this shed – personalise it and get the most out of our Tongue and Groove Apex Garden Shed. This shed is the solution to your ‘tool storing’ problems. Now, you don’t have to worry about those garden tools. Measuring 8 X 6, it is the perfect place to store tools for which your old shed never had room. The extra thick and sturdy framing provides a strong structure that can withstand the general wear and tear of a frequently used shed, while it’s extra tall eaves and an apex roof provide room for taller tools. The sturdy 12mm tongue and groove cladding, renowned for its stability and durability, ensures a long lasting garden building, fit for supreme storage of all your garden items. You don’t need to worry about bumping into doors and tools because double doors make storing and retrieving large items quick and simple. 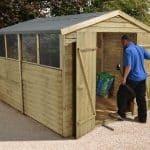 These structures are the ultimate garden sheds, which means that your outdoor and garden equipment can now be stored in an organised manner. Its size makes it great for smaller gardens or simply those wishing to accommodate only one building within their garden. 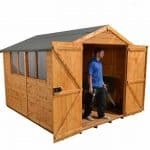 The Tongue and Groove Apex Garden Shed has many unique features that’s makes it a must have garden building. We’ll take a detailed look at those features to know what makes it the ultimate storage solution. Free Roofing Felt: High quality, mineral roofing felt is included in the package to protect your shed from harsh weather conditions. Made in the UK: The shed supports local British manufacturing and is made in the UK, making it affordable and easy on your budget. Double Framed Corners: Double framed corners give the shed added strength and makes the structure extra stable. Round Edge Framing: The internal framing is planed and rounded to avoid splinters and make the interior resistant to moisture. Double Doors: Double doors make storing large items quick and easy. Floor Joists: The shed comes with floor joists made of planed timber which provides a sturdy support to the base. 12mm Tongue and Groove Cladding: The structure is clad using 12mm thick interlocking tongue and groove boards. This feature prevents weather damage and provides maximum strength. Window Panel Placement Choice: The window panel can be placed on either side of the building, wherever you prefer. 10 Year anti-rot guarantee: The 8 X 6 Waltons Groundsman Garden Shed ensures just that with a 10 year anti-rot guarantee. Styrene Glazed Windows: The windows are glazed with styrene to make it shatterproof, which provides a professional and safe finish that most garden sheds in the market lack. 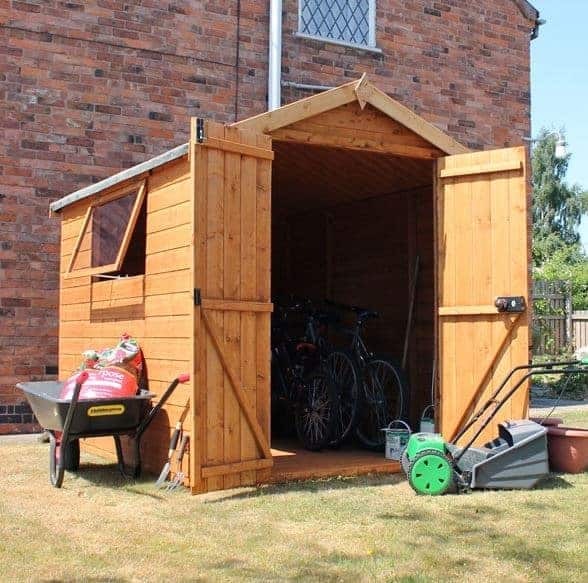 Pre fitted lock and key: This shed has a Pad-bolt to keep your items safe when you’re away. 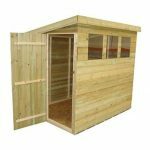 8 X 6 Waltons Groundsman Tongue And Groove Apex Garden Shed: How easy to build? The Tongue and Groove Apex Garden Shed will be delivered to your doorstep with all the parts. It is advised that two people erect the building; ensure that there is a suitable base ready to work on. All the parts are included in the package along with an instruction manual to guide you through the building process. The Tongue and Groove structure gives the building enhanced durability and strength, enabling it to withstand extreme winter conditions and everyday wear and tear with ease. The garden buildings are pre-treated with water based timber treatment for protection during transit. 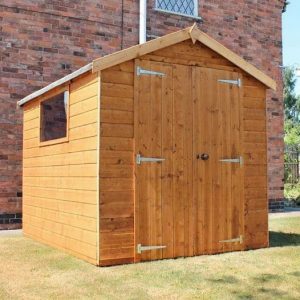 The manufacturer also gives a 10-year anti-rot guarantee, ensuring that you’ve purchased a quality garden shed that’ll last for years to come. The 8 X 6 Tongue and Groove Apex Garden Shed is a necessity for your garden. This timber garden storage shed has many features that are pleasing to the eye, while offering a ton of utility. The doors have a pre-attached rim lock so that you have a building that is more secure than your run-of-the-mill garden sheds. Its roofing felt provides protection against rain and seepage, while an adjustable window panel gives you the freedom of locating the windows on the side you want. 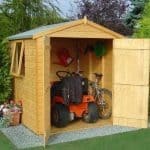 Save yourself from the hassle of building a garden shed yourself and get the 8 X 6 Waltons Groundsman Tongue And Groove Apex Garden shed now.